Interest in drones from the retail sector is growing rapidly as competitive pressures push retailers and distributors to develop new ways to make their supply chains more efficient, to automate warehouses, and to reduce delivery costs. Walmart, the nation’s largest retailer, recently announced plans to use drones for inventory management in its warehouses. Amazon, the nation’s largest internet retailer, is researching the use of drones to deliver packages to consumers. Global e-commerce giant Alibaba is testing delivery drones in China while DHL is already using drones to deliver packages in Germany. While interest from big name retailers has increased the hype surrounding drones, sales of drones in retail and distribution applications are expected to be a drop in the bucket compared to sales of drones in other commercial and consumer applications. Historically, government and military applications have dominated sales of drones in the US, and military uses still accounted for over 75 percent of sales in 2015. However, civilian uses will register dramatic growth and by 2025 will overtake government uses as the largest outlet for drone sales. Personal photography has been the most significant consumer application for drones so far. 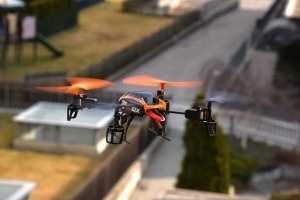 But camera-equipped drones are expanding their use into a number of other consumer and commercial applications. Drones are being used to photograph sporting events and by real estate agents to take pictures of large estates and other difficult to photograph properties. Utilities are using drones to inspect electric lines and communications towers. The use of drones in retail and wholesale distribution is currently minimal but is expected to increase rapidly over the next decade. While Amazon has received the most attention with its drone-based delivery concept, drones could have numerous uses in the retail sector including store site selection, building security, logistics, traffic analysis, and inventory management. Walmart alone has over 150 distribution centers and numerous supercenters in the US that are potential users of drones. A move to drones would allow the company to become more cost competitive by reducing the number of employees needed at each location, and more efficiently managing its supply chain. This is a key factor as the company faces continually increasing competition from both online retailers like Amazon and deep discount brick-and-mortar stores like Aldi. With drones already being tested and used for retail purposes outside the US and the many benefits drones can offer retailers in terms of cost control and efficiency, it is only a matter of time — and regulatory approval — before drone demand in the retail sector takes off. To get more information, read Drones (UAVs), a new industry study by the Freedonia Group, which presents historical demand data and forecasts. In addition, the study also assesses market environment factors, industry structure, and company market share. Top drone companies such as SZ DJI Technology, General Atomics, Parrot, and AeroVironment are also profiled in this study.